The small and neutral Switzerland is a historically multilingual nation. Established in 1291 as a “defensive alliance among three cantons,” the country now consists of 26 of these small administrative states, all of which have their own distinct identities and cultures. Because the cantons differ from one another, it comes as no surprise that present-day Switzerland is very diverse, comprised of an array of ethnic groups all speaking various languages. Despite this great diversity Switzerland has been able to define and maintain a national identity through its official languages: German, French, Italian and Romansch. These four languages directly reflect the four largest ethnic groups in the country. However, Switzerland’s multilingualism extends much further; nearly 20 percent of Switzerland’s resident population is foreign and speaks many other languages than the four officially designated by the Swiss government. Given such extensive diversity and the steady rise of English worldwide, how has Switzerland maintained its multilingualism and what is the role of English within it? I argue that Swiss multilingualism is maintained by the cultural interactions among the population and the devolved system of governance in which the regions are able to control policies like those of language and education. This allows for the preservation of distinct cultures and identities, but English threatens Switzerland’s existing structure of multilingualism as it grows in popularity worldwide. Additionally, it states that “The Confederation and the Cantons shall encourage understanding and exchange between the linguistic communities.” Thus, the devolution of policymaking power to the local level is used not only to preserve the cultural diversity of the nation, but also to govern and facilitate interactions among the people of Switzerland. What makes Swiss multilingualism unique is that it lacks a common trait found in most multilingual societies: language mixing or code switching. Jesse Levitt points out that this is because each language has “defined boundaries.” Each official language has its own role. 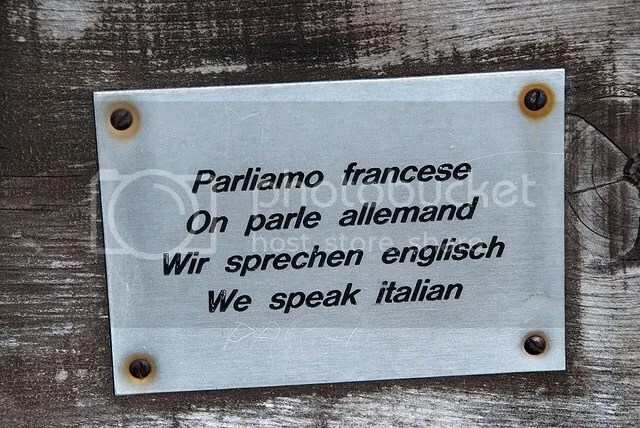 For example, “All federal laws are published in German, French and Italian,” the Federal Assembly uses French and the “Romansch normally use German” in formal situations. This principle of territoriality allows for only one official language per canton, often the local language as most cantons’ official languages fall along language boundaries, although there are a few bilingual and even trilingual cantons. Education policy is similarly guided by the principle of linguistic territoriality in that the language of instruction is determined by the cantons. Despite a canton’s decision to use one language in its schools, it maintains multilingualism in the region by offering courses on Switzerland’s other official languages. Daniel Stotz makes it clear that in Switzerland, “public education is entrusted with the objective of good multilingual citizenship.” As added support for maintaining multilingualism, Switzerland places a strong emphasis on school instruction in its citizens’ native languages. This gradual immersion makes it easier for them to process information in the language to which they are accustomed and provides a strong foundation for learning other languages. The Swiss approach of viewing knowledge of languages as an asset and not a deficit has maintained multilingualism in spite of “defined borders” and linguistic territoriality. Cross-cultural interactions also maintain multilingualism in Switzerland. Not all cantons are officially monolingual, and even those that are, are exposed to other languages through migration. People are free to move and are not limited by language. This means that in some cases, a person moves to a canton where he or she may not necessarily speak the official language. Jesse Levitt describes this, citing a trend of Swiss citizens moving from German-speaking areas to French-speaking areas, making it necessary for the German migrants to learn French as a second or third language. Multilingualism is not only maintained by canton to canton movement but also by migration from other countries. Foreigners make up about 20 percent of Switzerland’s resident population and statistics show that of these residents, nine percent use a language other than one of the four official Swiss languages. While this means that some students are not being educated in their mother tongue (especially if the mother tongue is not one of the four official languages), some praise Switzerland for providing immigrants with the same access to the dominant languages in school, in the belief that a common education promotes social cohesion. English poses a new threat to Switzerland’s long-standing multilingualism. It lacks a historical hold on the nation, but is slowly becoming the “lingua franca” for universal communication. It is estimated that “there are three times as many non-native English users as native” in the world today. Despite the large number of non-native English speakers, a study by the British Council has found that “by 2015, 2 billion people in the world will be studying English.” In Switzerland, “English is widely used in academia, administration and the big corporations” and there is growing support for the country to adopt English as the fifth official language. The Swiss National Science Foundation is a major proponent of this idea, stating that “knowing English would help public administration communicate with all citizens,” those living abroad and at home. As more Swiss citizens move among cantons and more foreigners move into Switzerland, it is clear that communication in one of the four official languages may be difficult and English could be a unifying force for the country. However, it does not have a long history of use nor does it represent Switzerland’s traditions. It threatens to shift the balance in favor of monolingualism as opposed to upholding the multilingualism that has existed in the nation for hundreds of years. As of now, the influence of English is contained mostly in schools, as major broadcast media outlets such as the Swiss Broadcasting Corporation continue to broadcast only in German, French and Italian. However, public opinion also seems to indicate a shift toward English. Grin and Korth found that Swiss public opinion, “while overwhelmingly in favor of developing access to English for all children in the education system, is torn over the position that national languages should have in the curriculum: should it be given more or less importance than English, or should they be on par?” These findings show a society leaning towards English, foreshadowing a future where the use of English could surpass that of Switzerland’s official languages. Switzerland is a historically multilingual nation with a form of government that for the most part, maintains a great degree of cultural diversity. However, globalization has led to the rise of English, which is now influencing the country’s language and education policies. The challenge that lies ahead for Switzerland is integrating English in a manner that does not undermine its long-standing multilingualism but instead, enhances it. 1. Grin, Francois and Britta Korth. “On the Reciprocal Influence of Language Politics and Language Education: The Case of English in Switzerland.” Language Policy 4, no. 1 (2005): 69. 2. Stotz, Daniel. “Breaching the Peace: Struggles Around Multilingualism in Switzerland.” Language Policy 5, no. 3 (2006): 251. 4. Levitt, Jesse. “Multilingualism in Switzerland, Belgium and Luxembourg.” Geolinguistics 30 (2004): 86. 5. Grin, Francois and Britta Korth. “On the Reciprocal Influence of Language Politics and Language Education: The Case of English in Switzerland.” Language Policy 4, no. 1 (2005): 69. 6. Grin, Francois and Irene Schwob. “Bilingual Education and Linguistic Governance: The Swiss Experience.” Intercultural Education 13, no. 4 (2002): 413. 7. Stotz, Daniel. “Breaching the Peace: Struggles Around Multilingualism in Switzerland.” Language Policy 5, no. 3 (2006): 252. 8. Rose, Sharon. “Mother Tongue Education.” International Studies 101. University of California, San Diego. La Jolla. 16 Nov. 2010. Lecture. 9. Levitt, Jesse. “Multilingualism in Switzerland, Belgium and Luxembourg.” Geolinguistics 30 (2004): 86. 10. Grin, Francois and Britta Korth. “On the Reciprocal Influence of Language Politics and Language Education: The Case of English in Switzerland.” Language Policy 4, no. 1 (2005): 70. 11. Rose, Sharon. “Mother Tongue Education.” International Studies 101. University of California, San Diego. La Jolla. 16 Nov. 2010. Lecture. 12. Rose, Sharon. “Globalization – is English Really Winning?” International Studies 101. University of California, San Diego. La Jolla. 21 Oct. 2010. Lecture. 14. Davidson, Keith. “Language and Identity in Switzerland: A Proposal for Federal Status for English as a Swiss Language.” English Today 26, no. 1 (2010): 15. 16. Grin, Francois and Irene Schwob. “Bilingual Education and Linguistic Governance: The Swiss Experience.” Intercultural Education 13, no. 4 (2002): 413. 17. Grin, Francois and Britta Korth. “On the Reciprocal Influence of Language Politics and Language Education: The Case of English in Switzerland.” Language Policy 4, no. 1 (2005): 74.